The Iberian town of Ullastret (6-2 B.C.) 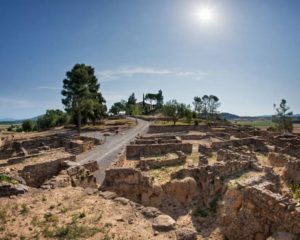 is located on today’s Empordà plain in Catalonia, and is one of the most well-known and outstanding iron-age archaeological sites of the north-west Mediterranean. This large urban settlement was formed by two inhabited centres, Saint Andrew Hill and Reixac Island, only 300 meters ahead. The two settlements extended over a walled area exceeding 15 hectares and they constituted the capital of the Iberian tribe known as Indiketes. The site was discovered around 1930 but it is the research carried out over recent years, basedin many cases on the application of the latest generation of geophysical prospection techniques,whichhas produced the greatest amount of knowledge about its urban and defensive structures, as well as the surrounding area. This has allowed us to develop a project for the virtual 3D reconstruction of the entire settlement , which in turn has benefit ed the study of Iberian culture over recent years. Because it is the best – known period from a scientific point of view, the reconstruction focuses on a specific moment in the settlement’s history, around the year 250 B.C. A multidisciplinary team was established to implement the project1. The team was directed by the Ullastret branch of the Archaeological Museum of Catalonia and was coordinated at a technical level by the Catalan Agency for Cultural Heritage, which worked together with Burzon*Comenge, a graphic design and 3D modelling studio. Additional assistance was received from many specialists in various fields, such as architects, anthropologists, hydrogeologists and specialists in naval architecture, who defined the multiple aspects that needed to be taken into account in order to produce this reconstruction with the greatest possible detail, precision, and scientific rigor. The first step in the reconstruction consisted of an exhaustive compilation of all the available archaeological information. In some cases, the team had to use comparative theoretical and/or experimental models that have not been archaeologically proven. While they are based on well-founded hypotheses, they will always be subject to future revision. Once these data had been validated from a scientific point of view, they were thematically categorized and passed on to the design studio responsible for their 3D modelling and texturing, in accordance with a pre-defined pipeline and guidelines inspired by the London Charter (http://www.londoncharter.org/). In this regard, the first aspect under consideration was the geomorphological structure of the settlements and the paleo-landscape, as this was fundamental to understand the settlement within its geographical context. Some important aspects were the vegetation that would have existed at that time and, especially, the transforming effect of human activity arising from the creation of access routes, agricultural exploitation, and the extraction of mineral resources. Next was the structure of the settlement itself: firstly, the defensive structures (wall and trench), and then the urban layout. This would help determine the position of the streets and thoroughfares, and subsequently recreate the individualized three-dimensional volumes of the various kinds of buildings and other constructions in the settlement. Finally, the movable elements of the buildings’ interiors were reconstructed and incorporated, in addition to other kinds of artefacts, based on real items of Iberian culture found during excavations (e.g. amphorae, pitchers, tools, swords, and shields) which now form part of the Ullastret Museum collection. Similarly, based on comparative research and alternative sources, other organic elements were also reconstructed. At a technical level, the model was built using 3D maps provided by the Cartographic and Geological Institute of Catalonia, which allow generating a geometrical mesh to represent the lie of the land. However, the Ullastret lake had to be reintroduced virtually because it was drained in the 19th century. The three-dimensional outlines of the landscape and architectural features were created with Cinema4D and 3D Studio Max applications. Objects were mainly reproduced from vectorized drawings exported into a 3D format, from which Maya software generated the textured model. All these elements were then imported into Unreal Engine 4, a game engine which is outstanding for its ability to create landscapes and for the photorealistic graphic quality it gives to images. This software also enables the relatively simple export of the entire project to immersive virtual environments such as multiscreen projection, 360º video, and VR headsets. The virtual models were constantly checked for scientific accuracy, right from the outset when only the volumes were being produced, and then throughout the entire working process up to the production of the final realistic reconstruction. This procedure allowed introducing any necessary corrections along the way, which in some cases meant changing preconceived ideas about Iberian settlements. 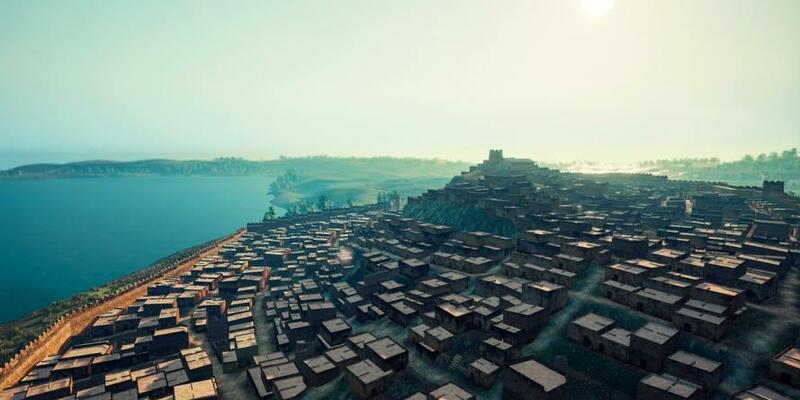 Indeed, Ullastret 3D has enabled creating a new image of the Iberian town and making it available to the public in a very powerful and accessible way. Figure 2. General view of the reconstructed Iberian town of Ullastret. After almost a year and a half of intensive work, the first phase of the project concluded with the creation and dissemination, via social media, of a video of the reconstructed Iberian town. It was very well received and had more than 30,000 visits. Yet, the aim of the modelling process was not limited to the creation of this visual representation. After evaluating various options from the technical and economic point of view, it was decided to develop two practical applications: an audio-visual for an on-site immersive room, and an adaptation for VR headsets. 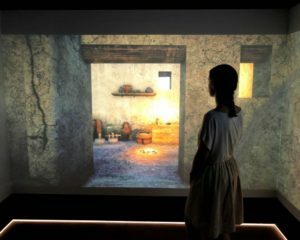 The immersive audio-visual is on display at the Ullastret branch of the Archaeological Museum of Catalonia. It is projected onto a four-walled room covering an area of approximately 10 square meters, which reproduce the dimensions and characteristics of an ordinary Iberian dwelling, such as those displayed during the audio-visual. The multi-screen projection visible on three of the four room’s walls is accompanied by a three-dimensional audio system synchronized with the movement of the images. Together they create an enveloping effect for viewers. A great deal of work has gone into the production of the sound so that it achieves a sonorous texture that matches the various virtual spaces that appear in the projection. The audio-visual is a six-minute overview of the digital model, filmed with virtual cameras. Viewers make a dream-like journey through the Iberian settlement, passing through its streets and empty houses. The story is narrated by a former inhabitant, a member of the elite, who remembers dramatic moments in the settlement’s history. This concept and narrative structure is an attempt at avoiding the traditional format of a lineal audio-visual describing and contextualizing the settlement. Instead it was conceived as a tool to enhance people’s understanding of this settlement, as well as their ability to interpret it. Figure 4. The HTC Vive experience at the Archaeological Museum of Catalonia during Barcelona Musem Night. In collaboration with “Visyon”, a VR and 360 production company, the audio-visual was adapted to the HTC Vive Virtual Reality headset. Unlike the immersive room, this device generates more complete and realistic experiences because viewers are totally immersed and can navigate within the virtual space in a natural way and at a life-size scale. Here again, great attention was paid to the audio. A complex 3D soundtrack was created, thanks to which the sources of the different sounds can be located in the surrounding scene, the overall sensation being one of perfect and total immersion. As work started on the immersive displays, a detailed study was undertaken to determine what kind of narrative would be most appropriate for these media. A thorough study of existing 360º videos and available VR experiences was made. It soon became clear that a traditional narrative would not be the most suitable. In our case, it was essential to create a story that would drive the spectator to the most important places of the settlement. It was also necessary to use visual and auditory resources to guide the spectators’ gaze so that they best explore this virtual environment. Finally, the script needed to emphasize key elements of the Iberian culture such as the inhabitants’ totemic animals, the social prevalence of warriors, and the collapse brought about by the Roman Empire. In the end, the story embroils visitors in the dream of a member of the settlement’s elite. Every night he returns to the town and remembers fragments of his life, such as the first time he saw the walls of the town, the children playing in the street, the courtyard where he learned to fight, and the empty city after the downfall. The protagonist’s voice guides visitors around each of the scenes included in this dream-like environment. In terms of navigation, it was decided that for the immersive room, the 3D effect would be best appreciated if the main motif was the constant movement that should have been seen in the streets and buildings; in contrast, for the VR experience, this would be achieved by determining the exact point at which visitors would appear, always in places with features that would encourage them to move around and explore(e.g. an interior courtyard, an open door). While the Immersive Room is on permanent display at the Ullastret branch of the Archaeological Museum of Catalonia, the VR version has been presented at specialized congresses, such as Arqueológica 2.0 (Spain), Archeovirtual (Italy), and Museums and the Web (USA). It has also been presented at popular events, such as the Museum’s Night in Barcelona and the Iberian Weekend at Ullastret, to raise people’s awareness about their cultural heritage. During 2017 it will become a permanent feature at the Archaeological Museum of Catalonia in Barcelona. People have responded enthusiastically to both the individual VR and the group Immersive Room experiences. For example, the reactions generated by some of the scenes, such as the flight over the Iberian town, and the appearance of objects that visitors can later see actually in the museum display cabinets, shows that this medium can have a big impact in visitors. For most people, this was the very first time that they used a VR headset, and the reaction to it was incredible. The evidence shows it is suitable for all ages, from 12-year-old children to people in their 90s. It is particularly interesting to note the impact it had on older people. Their experience was particularly vivid and emotional. Furthermore, it was a particularly striking discovery for people with restricted mobility. People confined to wheelchairs, for example, experienced a sensation of freedom of movement that was a revelatory experience for some of them. This has led to us to establish contact with hospitals specializing in rehabilitation to offer this service to them. The Iberian settlement of Ullastret (Empordà, Catalonia) is one of the most important archaeological sites of that period in the Mediterranean. It was discovered around 1930 but it is to the most recent research, based on state-of-the-art archaeological tools and methods, that a comprehensive knowledge of this Iberian capital has been obtained. This constituted the basis for the design and implementation of a scientifically-grounded 3D reconstruction of the settlement by a multidisciplinary team of specialists. After extensive research on current VR applications, they developed a couple of immersive experiences (for an immersive room on site and for HTC Vive headset) using digital storytelling, photorealistic imagery, and 3D soundspace. The evaluation of the production pipeline and the reception of the final products by end users has shown that this kind of Virtual Multimodal Museums can serve different purposes, display contexts, and audiences, as well as have an impact on archaeological scientific research and practice. reconstruction”, Archeologia e Calcolatori, 12: 221-244.
a l’Illa d’en Reixac (Ullastret, Baix Empordà)”, Tribuna d’Arqueologia 2012-2013: 236-243. Available online at: http://calaix.gencat.cat/handle/10687/123243. Accessed: 17/11/2016. d’Ullastret en els darrers anys (1995-2010)”, Tribuna d’Arqueologia 2010-2011: 63-99. Archaeological Geophysics. Museu d’Arqueologia de Catalunya-Ullastret.